Isaac and I drove up to Black Mountain on Friday morning. Isaac was meeting Natalie (who he is coaching) and Douglas Hunter (father of the four-by-four) to film an athlete profile. I left Isaac and met up with Eden, Marina and Jacob, who drove up to Black Mountain for the day. Together we walked over to the Glow Worm Project, an unclimbed block that Isaac, Eden and I found last year. Isaac had been working the moves since the beginning of the season and was able to show me the beta. I stuck all the moves but found that linking them would be very difficult. We speculate the grade to be around V12. 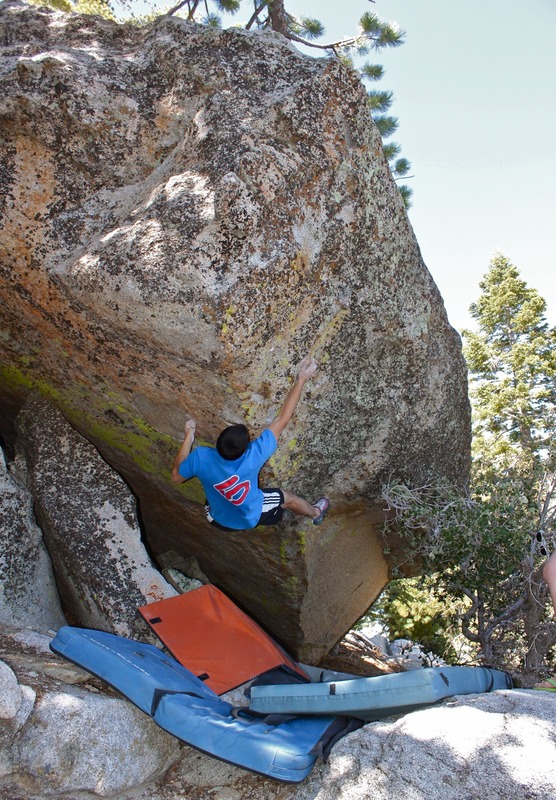 The next day, Isaac, Douglas and I hiked out to the Captain's Junk area to climb Das Angst (V10). I fell off the dirty top out holds several times. Unfortunately, I split the tips of two of my fingers and burst a bad blood blister trying the problem. I was done climbing for the trip. In the afternoon, Douglas left for home and Isaac and I decided to hang out at the campsite and wait for better temps. Four hours later, we mustered up some psych and hiked out to Bang On (V12). I watched Isaac work, and come close to sticking, the improbably large first move. At night, we went back to camp and joined the Black Mountain Bash. We watched the slacklining and interesting climbing competition. We woke up on Sunday, sunburnt, sore and tired. We made breakfast and drove home. It's good to be home.